IT’S RAINED a lot recently, and that means work. Yuck! I don’t mow the lawn anymore. I’ve, uh, outgrown it. I farm it out, so to speak, to the deadpan neighbor named Abel who has no brother called Cain. That I know of. He does have a brother, however. Probably named Pablo. Abel came Saturday for the first mow of the season. The rainy days have not arrived in full force just yet. It’s a touch early. But it’s been coming down more than normal for May, and the grass is gobbling it up, turning green, and growing at an incredible pace, especially around the edges. This photo shows a corner in the yard, very near the dining room window, so we look at this corner quite a bit. Two-thirds of it was planted years back by my child bride who has the annoying habit of putting down things that spread. Then she goes about her business, baking pastries and leaving her plant mischief to me. I do so wish she would not do that. There are three things growing in that corner. A philodendron, the centerpiece which I planted, and the stuff she planted: that ground cover — a real hog-wild spreader — and the vine growing up the wall, another constant battle for me, not her. I have to keep that vine from crawling over into the neighbor’s property (They are grumpy people) on the left and over into our Garden Patio on the right. I call it the Garden Patio back there because it’s where I store yard gear. It’s not attractive. But the name’s nice. Garden Patio. Sounds like a grand place to sit, but it isn’t. It’s concrete and a buried water tank. The rains of summer bring major changes to our world. It cools us off. It puts mud on our boots and constant puddles on our terrazas, niggling stuff to deal with. But the overall effect is positive, mostly because it keeps us cool through summertime. And the world turns lovely. Here at 7,200 feet above the not-so-distant Pacific shores. We could use some of that rain, if you want to send about a day’s worth to San Carlos. Bliss: I do not understand you people who live on the coast. The bugs, the heat, the grit. I can only roll my eyeballs at the masochism of it all. Rain would be only a moment’s relief. Long-term relief is only available by moving inland … and upward. Consider it. Yesterday we got our first *real* rain of the season, one that kept up through the night. 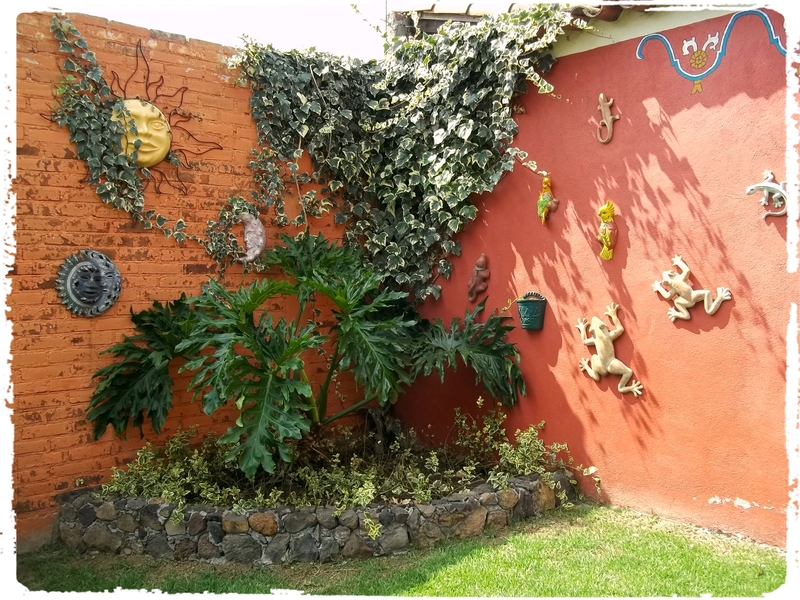 There is nothing better in the world than a Michoacan summer, where all is fresh and verdant, where the temp’s just right, and where nearly all is right with the world. Ay, Felipe. Ground cover is grand. The only care it needs is trimming. The vine on the wall is a nice backdrop to your philodendron. Andean: True, ground cover can be pretty nice, and that one is not so bad. I think I have a bad attitude toward ground cover due to something I myself planted here years back. It went absolutely berserk and it was a real bear to control and, at last, eliminate. But this is different, true. The vine crawling up the wall was also planted by (guess who? Not me) in two other spots in our expansive yard. This one in the photo is a sissy compared to what the other two monsters are doing. I agree with Andean. Grass reminds me of upper-class English estates and rows of identical houses in suburbia. There must be something better in Mexico. Christine: Years back I had a photo site that included lots of house shots, including the yard. Someone left the comment that the grass seemed odd due to my living in Mexico. I guess she expected packed dirt or something, which is hardly unknown here, of course. Ground cover might be nice except for the fact that the yard is so big. I think ground cover is normally used in smaller spots. The grass was here when we bought the lot, planted by the previous owner. I like it, even more so now that I no longer do the mowing. Our near-desert front yard requires little gardening attention. But our back yard derives some sustenance from the fosa (septic tank) and the grass there grows high on its nitrogenous diet. So yesterday, our landlord, Sr. M, came and weed whacked the back yard with his húiter, or string trimmer. He didn’t charge us anything for this service. Don Cuevas: Your landlord should not charge for trimming. It is, after all, his house. As for drying clothes, gotta install a transparent roof. It really helps. Springtime in the Sierras is a delightful time of the year, especially when cooled by the arrival of an early rainy season. Birds are singing, including a family of swallows who have mistaken my house for the Mission of San Juan Capistrano. Andrés: While swallows are nice birds to watch, they make nasty nests. The first few years here at the Hacienda, I was in endless battle with them in springtime. They would start one of their little mud-spit nests, and I would knock it down. It was a constant battle, but my persistence won the day. Now they don’t mess with my house anymore. If only they would just build pretty nests, it would be another matter. But they don’t.